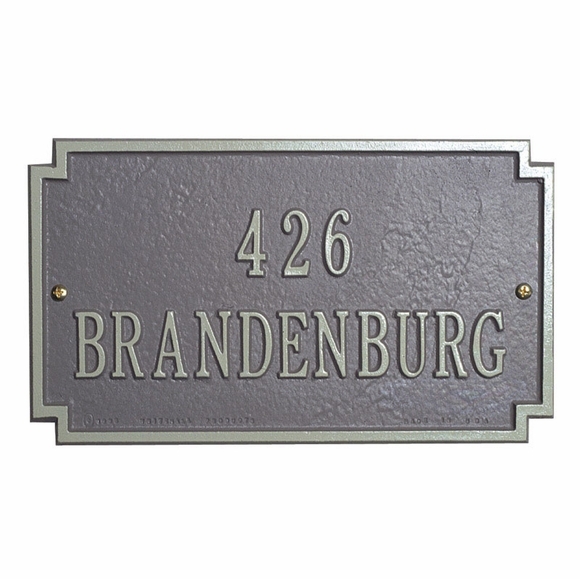 Personalized Brandenburg Address Plaque - - sophisticated rectangle address sign. Made in USA. 10" x 6" wall mount address plaque is made to order in your choice of 7 color combinations and two lines of personalization. Holds up to ten (10) characters on each line. Border trim matches the color of the characters. Colors: AB antique brass; AC antique copper; BG black with gold characters; BS black with silver characters; BW black with white characters; GG green with gold characters; OB oil rubbed bronze; OG bronze with gold characters; PS pewter with silver characters; RG red with gold characters; and WG white with gold characters. Personalized address sign defined by its sophisticated attitude. Made in USA.